Built for standard 56-1/2? (1,435 mm) track gauge. 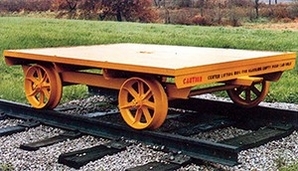 A new, retractable center lift ring has been added to help in handling the empty push car. Options include stake pockets, deck dump sills and brakes (two or four wheel). Our technical staff can design and custom-build push cars for your specific applications to handle capacities up to 40,000 lbs. Call us toll-free at 1-800-297-1383 or e-mail us for details.